These are only some of the services that Russellbuiltit can provide for your needs. Renovations/Alterations - We do renovations/alterations for most projects big or small to suit your budget and your time frame. Bathrooms - We do most renovations/alterations for most bathrooms including the removal of a total bathroom and replacing it, we try to work around your needs to keep your bathroom working for you while renovating, however sometimes it may not be possible. 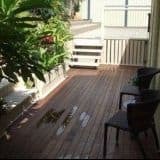 Decks, Pergolas and Outdoor Entertainment Areas - We can source the highest quality timbers available as we have owned and operated timber yards in the past so we have a lot of knowledge on accessing these materials at the right price. We also do the sub-structure in galvanised steel to whatever your scope of works requires. We have our own plans for the above projects or we can work into any plans you provide. Carports, Garages and Sheds - We build timber brick or steel structures and our concrete flooring is second to none. Roofs can be skillon pitched or gable end. These can be built to any scale for any project. Tiling - All types of wall or floor tiling, indoors or out. Termite Damage Repairs - We can replace a quarter of the house or more in any area of the house to a simple as replacing a piece of a hand rail and everything in between.